One aspect of creative confidence that I think is very important is collaboration. For kids to dive into creativity and to put their efforts out into the world, it is helpful for them to have a partner in their pursuits, to see someone else face their own creative vulnerability. When a child sees a parent or older sibling willing to create, accepting of mistakes, taking chances…they are more likely to do so themselves. This concept works just as well for adults. When embarking on the journey to strengthen your creative confidence, see if you can find a friend, co-worker, significant other or family member to join you on the adventure. You can encourage one another, work together, and draw each other out of your shell. Having someone to cheer you on can make the process so much easier. Collaboration can take many forms. You can paint a picture together, work to create characters and stories, write or improvise a play. You can go back and forth writing verses of poetry or design a mural for the wall. Today, I’m going to look at two types of collaborative art that work especially well for children. We have had great success with these activities in our home. They foster a sense of teamwork and grow creative confidence. The first is the coloring page swap. This has been a favorite of my husband and daughter for years. They each start with a blank piece of paper and a pencil. On that sheet of paper, they draw a picture, something that would be fun to color in. Maybe it’s a plane or a rocket ship. Maybe it’s a bouquet of flowers or a hot air balloon. I find it’s best to each draw something different, to avoid comparison. When they’ve finished drawing, when they’ve added all the detail they’d like, they swap pages. Now it’s time to break out the crayons. M colors Dad’s drawing and Dad colors M’s. When they’re finished, they’ve got two masterpieces that they’ve worked on together. It’s both a confidence building and bonding experience. The idea is to finish the drawing based on the prompt. Working together on creative exercises with a friend or family member can make the process more fun and less intimidating. You’ll create something together, rooting each other on, inspiring each other to create. You’ll grow your confidence and make memories, too. The Gently Guided Activities for this post are to try the creative exercises described above. 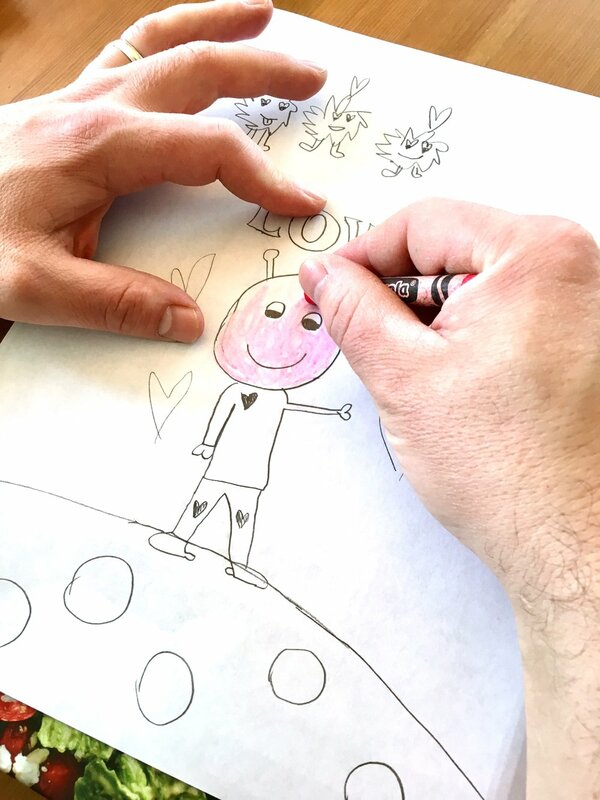 Find a partner and create and swap coloring pages. Create doodle book prompts for each other and see what you each design. Have fun with it. Laugh together. If you try either of these activities, I’d love to hear about it. Leave a comment or head over to the Facebook page linked on the side to post a picture to the Bonnythings Creative page.